Italian striker Mario Balotelli and Steven Gerrard ensured Liverpool marked their return to the Champions League with a dramatic victory in their first fixture, though they were far from convincing against Bulgarian champions PFC Ludogorets Razgrad. Liverpool’s back-line never looked really comfortable, and some shaky moments would have cost them the head against the likes of Real Madrid. Nevertheless, the Reds’ full-backs – Javier Manquillo and Alberto Moreno – showed why Brendan Rodgers was so desperate to sign these two Spaniards. Especially, Moreno rose above everyone else as he was, once again, magnificent for his side, amassing a Squawka Performance Score of 47 – more than Mamadou Sakho and Dejan Lovren. 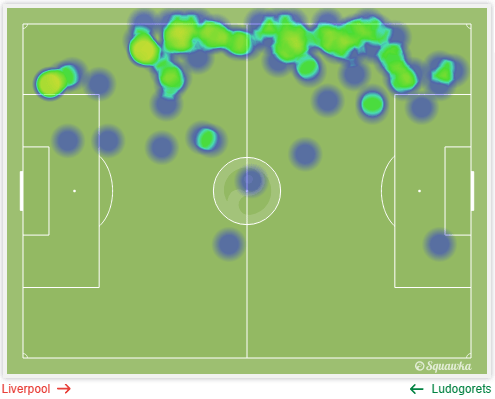 The 22-year-old covered the whole left flank, as he was getting acres and acres of space wide on the left, shown well by his heat map. The highly rated defender picked up spots all around the pitch, which resulted in a quick-fire of crosses and passes. However, he found his crosses overhit most of the time, failing to deliver the ball seven out of ten times. It seems that he either stops, looks up and then decided to give it a go, or his head just explodes so his mind completely disconnects. As a matter of fact, he is not driving on the highway, where one constantly has to look right and left to see if any traffic is coming. Moreno has to realize that he is on a pitch, and that those split seconds make a huge difference between a successful, or in this case unsuccessful, cross. Nonetheless, one perfectly timed and weighted ball made the fans at Anfield forget about the previous ones as he whipped the ball into the direction of Mario Balotelli, who used his strength to control the ball before drilling it past Borjan. A few seconds earlier, the Spaniard pulled off a magnificent recovery tackle in the box, to prevent Marcelinho from scoring. Then the former Sevilla starlet galloped forwards and smashed the ball into the box, which resulted in ‘Super Mario’ scoring the opening goal in front of the Kop. This shows that Moreno is able to make a great, dangerous-looking tackle, as well as the much-needed composure. He impressively won 100% of his tackles, made two interceptions and cleared two balls out of the box. Brendan Rodgers has brought a gem to Merseyside, as Alberto Moreno’s last night performance showed that he is able to cover Liverpool’s left flank for many years to come.